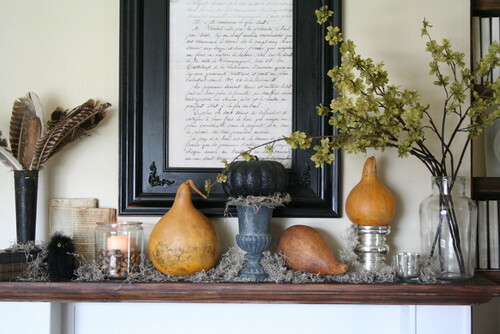 This fall mantel display makes use of a few key pieces that are easy to find, and other objects you may already have at home. Here, gourds in a range of shapes and shades are the prominent subjects that first catch the eye. Aside from adding height, ceramic and metallic urns help achieve a lovely eclectic look. A clear glass hurricane jar with flowering branches adds freshness and evens out the heavier elements. Vintage books in the background bring depth and dimension, while a bit of Spanish moss and pheasant feathers add texture. An adorable fall icon, the little owl acts as an effective black accent and provides irresistible charm. The classic combination of black and white conveys a timeless elegance that is perfect for modern and contemporary homes. Simple yet sophisticated, this vignette looks as good on a kitchen countertop or foyer console as it does on a china cabinet in the dining room. 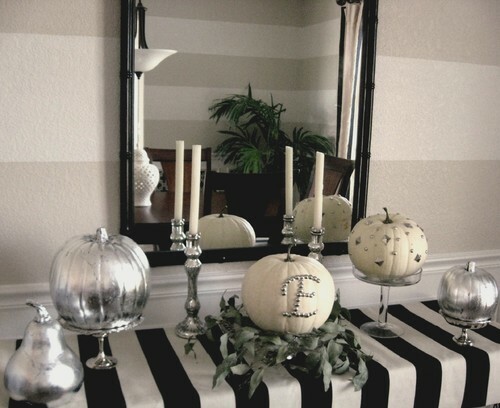 Incorporating white and silver pumpkins, this display evokes the cool and crisp feeling that permeates the season. Get a similar look by spraying artificial pumpkins with metallic chrome paint and placing them on glass or silver dessert stands. If natural white pumpkins are not available, spray artificial ones with matte white paint then embellish them with upholstery tacks or vinyl decals. No matter its size, a well-designed vignette leaves a lasting impression. 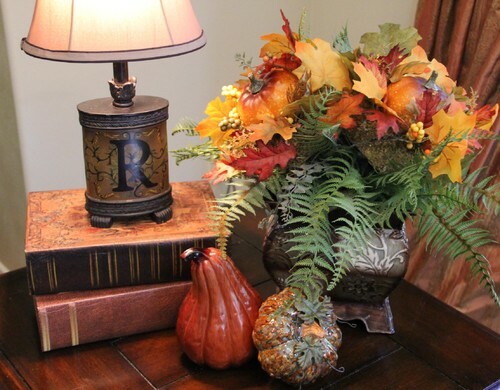 Diminutive fall displays such as these are perfect for smaller homes or rooms. 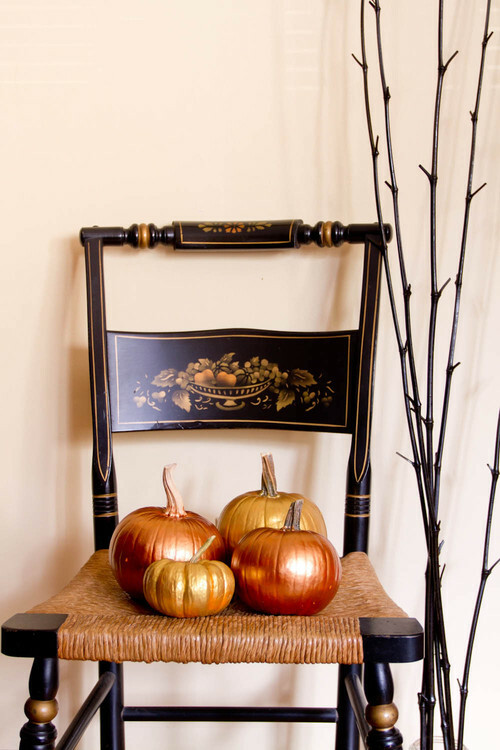 A classic Hitchcock chair makes a great setting for a simple yet stylish composition of pumpkins. Give ordinary gourds a gentle shimmer by spraying them with copper and bronze paint. The metallic coat highlights their curves without straying away from their natural color. A grouping of bare black branches brings added height and drama. This traditional vignette packs all the beauty of the season into a small space. Recreate it on a side table or nightstand by arranging a short vase of fall-colored leaves alongside real or artificial pumpkins. Placing an antique lamp atop a stack of vintage books adds height and functionality. Show us your own vision of a breathtaking vignette by sharing your fall decorating ideas, photos, and tips on the comment section.